1 Numerous skin conditions abound. People suffer from rashes, discolorations, bug bites, and so on. Children are not immune to these things. For example, children often get one commonly occurring skin condition called impetigo. 2 Impetigo can appear on any person, young or old. However, it is a skin infection that mainly affects infants and children. In fact, it is one of the most common skin infections among children. It is very, very contagious, although it is rarely serious. 3 In general, impetigo is caused by bacteria and is known for its crusting skin lesions. It most often appears around the nose and mouth. The bacteria are often able to enter an area where the skin is broken, such as through a bug bite or cut, but it can develop on skin that doesn't appear to have any of these breaks. Scratching and touching the sores of impetigo will cause it to spread to other parts of the body and to other people. 4 There are three different kinds of impetigo: impetigo contagiosa, bullous impetigo, and ecthyma. 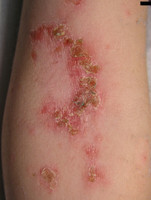 Impetigo contagiosa is the most common kind. Usually, a red sore appears on the face. It ruptures rapidly and oozes pus. This creates a honey-colored crust. Gradually, it disappears without a scar. It may be itchy, but it is not normally painful. Some lymph nodes nearby may become swollen, but there's usually not a fever. That's the good news. The bad news is that it spreads easily and is very contagious to others. Bullous impetigo tends to affect the little ones, normally under two years old. The blisters with this kind of impetigo are typically painless but rather red and itchy. The blisters normally occur on the trunk, arms, and legs. When these blisters break and scab over, they often form a crust of yellow color. The blisters of bullous impetigo often last longer than the blisters of impetigo contagiosa. Finally, the third kind of impetigo, called ecthyma, can be more serious. The sores are painful, appear on the legs and feet, and often infect the dermis, the skin's second layer. The sores can turn into deep ulcers which scar. 5 What causes impetigo? As you already know, bacteria do. The two kinds of infection are Staphylococcus aureus, or staph for short, and Streptococcus pyogenes, or strep for short. The staph bacteria more commonly cause impetigo. It is important to know that both kinds of bacteria live on the skin all the time. It is when there's an opportunity to enter the skin that inflammation and infection result. For children, that might mean a bug bite or a cut. For an adult, that can be true as well, although it is more common for it to enter where there is another condition present such as dermatitis. In general, impetigo caused by strep results in smaller blisters, while the impetigo caused by staph results in larger blisters.